When DeKalb Medical Hillandale first opened its doors in Lithonia, Georgia, they weren’t prepared for the influx of patients TO THE FACILITY. As a result, patients experienced lengthy wait times during emergency room visits, resulting in customer satisfaction and employee morale ratings plummeting. After resolving several of the operational issues over the course of a few years, Hillandale wanted another shot, a grand reopening of sorts. A multiphase strategic process was utilized, beginning with market research, including internal and external interviews, surveys and focus groups. Learnings revealed that it was actually Hillandale's low awareness and not a negative perception that was the main issue. Potential patients just didn't know about Hillandale or the level of care that it provided even though it was in their community. Research also revealed that the hospital's advanced technology, renowned specialists, uber clean facilities and free parking really distinguished it from other hospitals. So we set out to tell that story. From that, came the line and campaign “The Cure for the Common Hospital” brought to life in a TV commercial, radio spots, print ads, digital banner ads, out-of-home billboards, community outreach, special events and online virtual tour videos, all of which highlighted personnel and key components of the hospital experience from beginning to end. 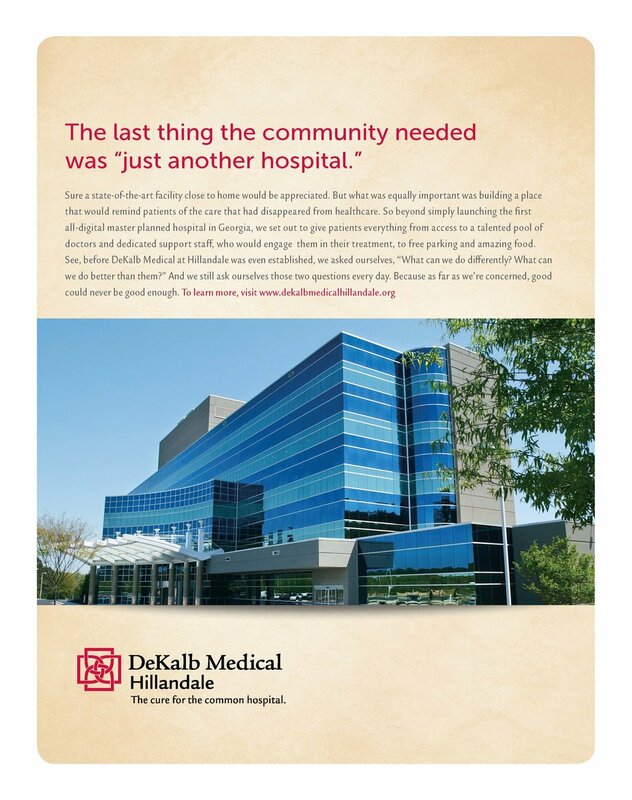 According to the National Research Corporation, DeKalb Medical Hillandale’s score for the “Most Preferred for All Health Needs by Decision-Maker” nearly doubleD within the first quarter of the campaign. Additionally, hospital usage went up, (including a 16% increase in specialty services like mammograms) along with morale, resulting in markedly improved employee satisfaction scores.